This is a new set of 3 padded black velvet easel necklace displays in 3 different styles. These displays highlight the beauty of any necklace and are great for displaying jewelry on your countertops and showcases. 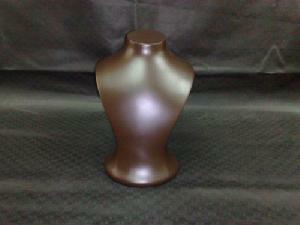 This is a new set of 2 black plastic necklace displays in 2 different styles. These display the beauty of any necklace and are great for displaying jewelry on your countertops and showcases. One includes an adjustable stand and both are washable.